I prefer the music of the Holocene Epoch myself, but I guess they were really just building on what was already going on in the Pleistocene Epoch, creatively speaking. 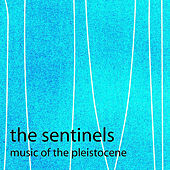 At any rate, Music of the Pleistocene is a strong debut from the Chicago four piece, The Sentinels. The instrumental core of the band is comprised of a few local rock veterans you may remember as being The Tuffets a few years back. The Sentinels sound nothing like that proto metalling trio. No, this band comes at you from a straight rock angle, employing the requisite riffs and rhythms to allow vocalist Liz Elle to work it out on the mic. Which she does by trafficking in such human emotions as love, loss and lusting after girls (you read that right). The record sounds great, the songs are well-thought out, the choruses are as catchy as they should be, which leads me to the conclusion that The Sentinels are, in fact, Guardians of Rock.